Robert Schuettinger (“Bob”), the founder and director of the Oxford Study Abroad Program which brings hundreds of US and other visiting students to Oxford University each year, died on 3rd September 2018 following a long illness. 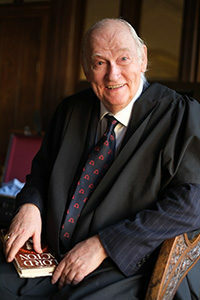 A committed Anglophile, Bob Schuettinger spent more than thirty years in Oxford guiding visiting students through the intricacies of university and British life, but over his long career he had been a university teacher, author and editor of academic works and public servant in his native United States. Bob Schuettinger was born in 1936 in New York City and received his BA from Queens College in the City University of New York before studying at Columbia, Oxford and the University of Chicago (where he received his MA in 1968).During his study years he was the student of Chicago’s Nobel Prize-winner in Economics, Friedrich Hayek, who encouraged the publication of his early studies of Alexis de Tocqueville in 1961. At Oxford, his graduate supervisor was Sir Isaiah Berlin. Hayek and Berlin were key figures in the intellectual movement challenging the hegemony of socialist thought in the West, a cause to which Schuettinger’s forty publications also contributed. Growing up in a post-war America which went from the confidence of the 1950s to the crises of mid-1960s and the growing economic woes of the 1970s, Schuettinger’s commitment to classical liberalism as opposed to the US variant of social democracy which called itself “liberalism”, Schuettinger published on both the economic fallacies of price- and wage-controls but also their authoritarian implications. Scarred by Nixon’s failed efforts to control wages and prices through administrative mechanisms rather than monetary policy, Schuettinger was an early populariser of monetarism in his book, Forty Centuries of Wage and Price Controls (1979) showing how even the much more draconian penalties imposed by ancient emperors had proved equally futile when supply and demand were distorted by the boosts in the money supply or uncontrolled government spending. First published in 1979 (it was reissued in 2014 as challenges to what had become monetary orthodox were rampant in the aftermath of the crash in 2008), the fact that his co-author was Eammon Butler of London’s Adam Smith Institute was an indicator of Schuettinger’s outreach across the Atlantic to the intellectual milieu which was helping promote Margaret Thatcher’s reversal of Britain’s years of Keynsian-inspired stagflation. Schuettinger’s period at Chicago under Hayek introduced him to the free market network, the Mont Pelerin Society, to which he remained loyal for the rest of his life. The heirs of Ludwig von Mises and the Austrian School of Economics, Hayek and Milton Friedman, were proponents of reeling back the state from its over-extension into economics and leaving it to concentrate on its core functions, public order, defence and other matters that Adam Smith had defined as “more important than opulence” as Bob liked to recall. If Nixon’s domestic agenda was a disappointment, Ronald Reagan’s election offered Bob Schuettinger the chance to serve his country as a presidential aide. Although he had taught political science, political philosophy and history at the Catholic University of America from 1966-68 and at Lynchburg College, Virginia in the early 1970s, he was always attracted by seeing the political process in practice and contributing to it. He also noted wryly that although his intellectual philosophy was out of kilter with his tenured colleagues who tended to the left in the anti-Vietnam and Watergate era, his students who were heading to the real world after graduation were more appreciative of his approach. That meant that at Lynchburg, he won the “Best Professor of the Year Award”, only to be promptly fired by the tenured radicals. Later he would teach again, at St. Andrews University in Scotland and at Yale, where he was an Associate Fellow of Davenport College. He lectured at the Kennedy School of Politics in Harvard and was also a Visiting Research Fellow in International Relations in Mansfield College, University of Oxford for a three year term (1989-92), but in the 1980s he was able to participate in the Reagan Administration (starting at its inception as Assistant Director for National Security Policy in a Presidential Transition Office) and to observe how politics are made from a perch in the Executive Office Building as he had as a Congressional aide. He had a ringside seat as the New Cold War after 1981 gave way to the Reagan-Gorbachev détente that heralded the end of the Cold War and more importantly of the Communist model as an alternative to Schuettinger’s preferred free market democracy. During those years in the US government when Schuettinger served as a senior aide in foreign affairs in the US House of Representatives, as deputy to the Under Secretary of State for Security Assistance, as a senior policy aide in foreign policy in the White House and in the Senior Executive Service in the US Information Agency and the Pentagon (Director of Long-Range Policy Planning), he remained committed to the need for an intellectual counter-revolution to cement the role of classical liberal ideas – now often called conservatism – in American and Western public life. Schuettinger had worked side-by-side with Ed Feulner in Congress so he was a natural choice to join Feulner’s Heritage Foundation which was almost at once the key “conservative” think tank in Washington. As Director of Studies at Heritage, Bob Schuettinger was founding editor of its social science quarterly, Policy Review, now published by the Hoover Institution of Stanford University. Policy Review brought clearly-written and well-argued conservative ideas to a wide audience of politicians, journalists, business people and students. It reflected Bob’s penchant for popularising ideas started with his selection The Conservative Tradition in European Thought (1970) which drew on politicians’ speeches and political thinkers at the cross-over of liberal economic thought and traditional values. Apart from articles and reviews, he authored/co-authored and edited 19 books, including, Lord Acton: Historian of Liberty (1977), The Conservative Tradition in European Thought, and Forty Centuries of Wage and Price Controls, while he wasn’t afraid to tackle controversial contemporary Cold War issues as in his edited collection South Africa: The Vital Link (1976). The establishment of the Oxford Study Abroad Program/Washington International Studies Council in 1983 gave Bob Schuettinger the opportunity to return to his role of educator and to his adopted intellectual homeland in Oxford and Britain. Although both American and European universities were accustomed to students taking semesters of study at different institutions to benefit from particular professors’ teaching or the resources of given libraries and faculties, it was a new idea for Britain. Bob worked hard to persuade Oxford colleges of the benefits to their university of receiving visiting students. Soon enough dons saw that they could teach high quality students who wanted to study subjects off the core – and one might say – unchanging Oxford syllabuses that happened to be the scholars’ particular interest. Colleges got students who joined in activities from sports to music-making. Bob himself was an Associate Member of the Senior Common Room of Christ Church, Oxford, as well as, for instance, a Visiting Research Fellow (2013-14) at the Rothermere American Institute at the University of Oxford, where he worked on his intellectual mentors, Lord Acton and Tocqueville. At the same time he fostered his links with US academe and served as an affiliated faculty member in International Relations at the Institute for World Politics in Washington, DC, whose bright graduates were frequent visitors to Oxford in its Trinity (summer) term. Bob also inaugurated a Reagan-Thatcher studies programme in the summer vacation to encourage serious study of the ideas and the key practitioners whom he had admired. Bob threw himself into British life. He expanded his friends and contacts in public as well as academic life. A member of the Beefsteak Club in London, he was a generous host who expected his guests and fellow members to debate with no holds barred. He enjoyed bringing the politicians, economists and military figures he met in London to Oxford to speak to his American students in addition to the normal Oxford round of tutorials and lecturers. Schuettinger used his extensive contacts in the world of politics and economics to broaden his visiting students’ understanding of Britain and Europe and contemporary issues helping successive generations to see issues like the War on Terror or Brexit through other eyes. Never ashamed of his Yankee origins, but a sincere Anglophile, Bob tried manfully to explain the exotica of British culture – from the parliamentary system to pudding “not dessert” – to American students in Oxford. Bob’s sometimes irascible personality and politically incorrect utterances hid a generous heart, in sympathy for human frailty and vagaries. Student follies would excite eruptions of contempt when told about them by his staff, followed by quiet mollification of their consequences. Always enamoured of sea-faring folk, despite his classification by the US Navy following his service as its member with the least mechanical ability, Bob was happiest at sea, enjoying cruises and the conversations with old friends, sparring partners, and new acquaintances which they offered. As illness weakened him, he was determined to enjoy one last voyage. Despite his frailty, he took himself on a river cruise down the Danube and confounded medical prognostications by returning to Britain, where sadly his final illness took hold. But even in the last months of his life Bob remained a lively presence, enjoying playing host to old friends and cared for by his loyal staff at OSAP, who tended to his needs as well as responding to his hand on the office tiller to the end. He is survived by two brothers, Kenneth Schuettinger (and Ken’s children Donna, Kathy, Michael and Kenny) and Dennis Schuettinger (and Den’s children Cheryl, Susan, Kristen and Lynn) of Long Island, New York, and by many great nieces and nephews. He was buried in his native country. When I founded the Washington International Studies Council (WISC) and the Oxford Study Abroad Programme (OSAP) in 1984, I began by asking myself what I would want if I were a study abroad student. I would want to study with some of the best scholars and alongside some of the best students in the world. I would want to be as integrated as possible into the foreign college or university. I would want to live in the same housing with local students and join with them in sports teams, clubs and other extra-curricular activities. I would also like to be able to study almost any academic subject of my choice. Having many friends in Oxford since I first enrolled as a graduate student in 1962 enabled me to carry out the kind of program I would have liked for myself. Experienced study abroad advisors often say that the best overseas program is one in which students study with the local scholars and have substantial integration with local students while having support from people who understand the needs of North American students to make certain all goes well and that student problems are dealt with promptly. This is exactly the program we have created in Oxford. Students often tell us they have become a different person after only a few weeks in Oxford. This is largely due to the intensive one-on-one tutorial system in which each student has a personal tutor, who is usually a leading scholar in his or her field. The tutorial system, which is integral to education at Oxford University, is also one of the main reasons why it is ranked among the top 2 or 3 universities in the world.